If you’re looking for an all-in-one eCommerce solution, then PinnacleCart could well be a good choice. This software was created so sellers will little to no technical knowledge can quickly and easily start selling and promoting their products. If that sounds like you, then you might be in the right place. There are a variety of eCommerce and shopping cart solution for you to choose from. But, PinnacleCart is different in that it’s a SaaS product, meaning they take care of everything for you. Most eCommerce and shopping cart solutions are simply add-ons to your existing website. PinnacleCart handles everything for you, and so much more, which is what you need if you’re planning on starting a serious eCommerce business. Below we dive into PinnacleCart and cover all of the features of the software, we also run through some basics of getting the software setup on your site, so you can begin selling as quickly as possible. PinncaleCart was created by a seasoned team of industry experts and developers with over 20 years in the development industry. This care, knowledge, and attention to detail is shown in every aspect of their product. PinnacleCart has been around for over a decade now and in that time they’ve established a solid name for themselves within the competitive eCommerce and online shopping cart space. PinnacleCart lets you quickly and daily add and edit products, manage your orders, create and customize your website and so much more. Plus, since it’s an all-in-one solution you don’t have to manage your web hosting or any of the other technical elements of running a website. For a monthly fee all of this is handled for you. Of course, we dive into all of this in greater detail below. Keep reading for an extensive breakdown of their features. They offer a wide variety of price points for different levels of businesses. So, if you’re small and are worried about this software being able to keep up with your growth, then you don’t have to worry. PinnacleCart is built in a way to grow with your business as your traffic and number of sales continues to grow. All you have to do is upgrade to a plan that supports more traffic and storage. Currently, they offer four different pricing tiers. The plans highlighted below are all brown down by the level of hosting you require for your online storefront. Every plan below comes readily equipped with daily website backups, unlimited phone and tech support, and is PCI/PA-DSS compliant. Beyond the plans below you can also purchase additional add-ons and services for your site. Common upgrades include things like: premium security certificates, website consolations, and even SEO audits. The Startup plan is perfect for those just starting their very first online store. This plan will run you $29.95 per month, and comes with the following features. If this level of enterprise hosting isn’t enough for your business, then they do offer additional price points. There are their VPS solutions and run anywhere from $249 to $349 per month. You can learn more about these offerings on this page. However, PinnacleCart does offer a 14 day free trial. So, you should definitely take advantage of this trial period before you make a final decision. Often, a free trial will give you the time necessary to get used to the product and be able to determine if it’s a good fit for you and your business. PinnacleCart offers a very impressive and extensive array of features. Whether you’re looking to get your first online store off the ground, or scale and grow your existing storefront, this software will have something for your needs. It’s hard to find a standalone software solution that caters to every need of running an eCommerce store. Most existing softwares require you to piece together these solutions from a variety of different sources. Below we profile the most common and useful features of PinnacleCart. If you’re looking for a full-fledged list of features, then check out this link. PinnacleCart offers 30 different mobile-friendly design templates for you to work from. This is pretty huge as a lot of eCommerce providers have templates that aren’t mobile friendly. There’s a large chance your customers are going to be using their phones to browse your store, so you need to cater to their needs. Most of their themes come equipped with features like, photo gallery, image magnify, and lightbox, so your products will look beautiful. When designing your site you can use their drag and drop editor, so there’s no need to modify any code to get the store you desire. Take a look at this small sampling of what they have to offer. All it takes is a single click to activate a new theme on your site and begin customizing. For a full list of the theme templates available, take a look at this page. If you’re looking for a professional team to do complex edits to your site, then it might be worthwhile to check out their premium design packages. These packages typically run from $2100 to $5200. 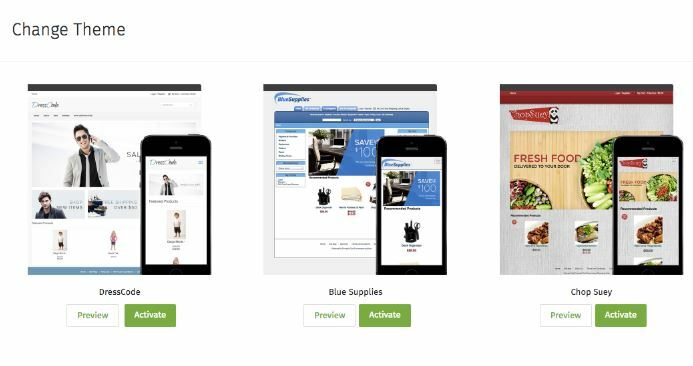 PinnacleCart comes equipped with over 25 different add-ons and integrations to help you extend the functionality of your store. For a full list of supported add-ons, then check out this link. Best of all, it only takes a few clicks to integrate your desired add-on with your site. Below we highlight a few of our favorite add-ons that will take your store to the next level. If you’re not utilizing the power of email marketing to stay in touch with new customers and build a deeper bond with your customers, then you need to start. This integration unlocks the power of email marketing with your storefront and lets you add Mailchimp sign-up forms to your site. Are you looking for an easy and effective way to keep track of website data, and create easy-to-digest reports? If so, then this add-on is for you. Addshoppers lets you track RIO, measure your social data, and collect other kinds of data across your site. Plus, you can easily share this data with the right members of your team. If you need some assistance tracking your shipping and generating shipping labels, then is add-on is for you. Endicia lets you track packages and shipments, create discounts, and even print postage. This will greatly speed up product delivery for you and your customers. Quickbooks is a preferred tax and accounting solution for most business owners. 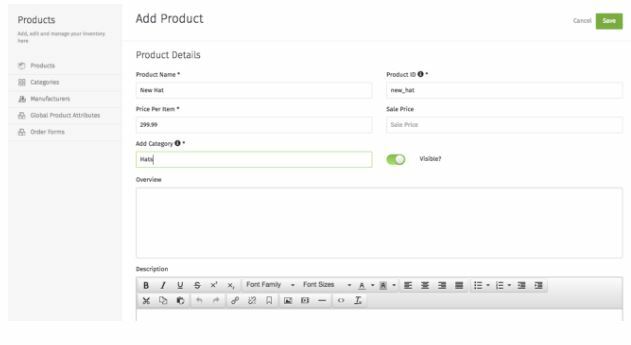 With this add-on you can easily integrate your Quickbooks account with the backend of your store. This makes it incredibly easy to track revenue and generate other financial reports. Keep in mind that this integration is only available if you’re not on the Startup plan. PinnacleCart is currently equipped to integrate with over 30 different payment processors. This list of payment gateways will ensure you can work with your preferred payment gateway. With PinnacleCart you’ll be able to easily enable credit and debit card purchasing, as well as a host of other options. PinnacleCart’s preferred payment gateway is First Data. If you chose to use this payment gateway you’ll be able to take advantage of their Small Biz plan, which will lower your merchant rates for the first 4 months of use. With this software you can also setup recurring payment options, and even provide different currency options and languages. This lets you easily sell your products to an international market. 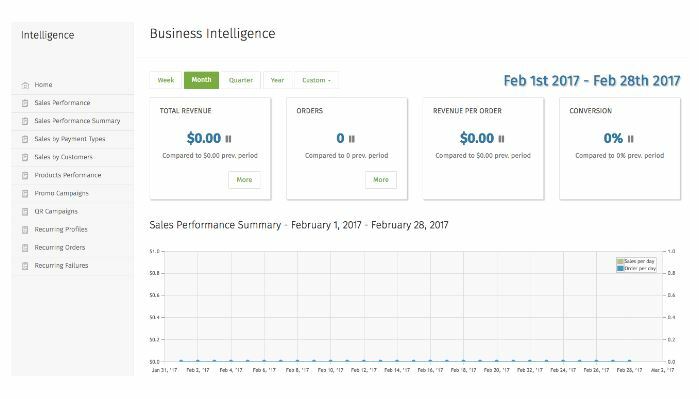 Their handy business intelligence dashboard makes it easy to see how much your store is currently making at a glance, there’s no need to dig through reports to see your current sales stats. You also have the ability to filter your sales results by customer, products, promo campaigns and much more. This truly gives you a bird’s-eye-view on your stores performance and lets you optimize accordingly. A lot of eCommerce platforms simply help you setup your store and manage your products, and that’s where the guidance typically ends. PinnacleCart takes this a step further. Now, PinnacleCart doesn’t offer a ton of onsite marketing help, but they do offer a variety of promotion tools. For instance, you can easily integrate your store into your existing Facebook page. 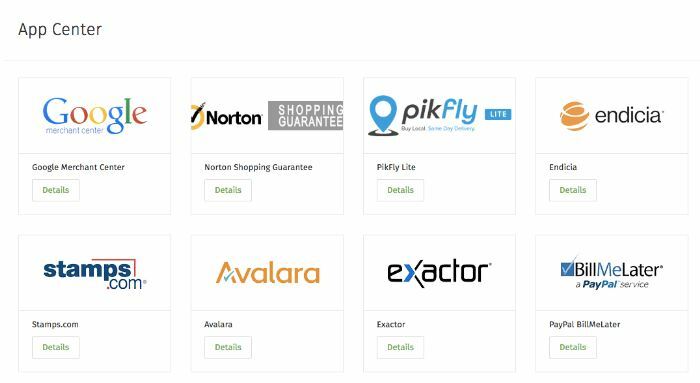 There are also various social add-ons which will let you sell your products on existing retailers, like, Google Merchant, ShopZilla, eBay, Amazon, and much more. 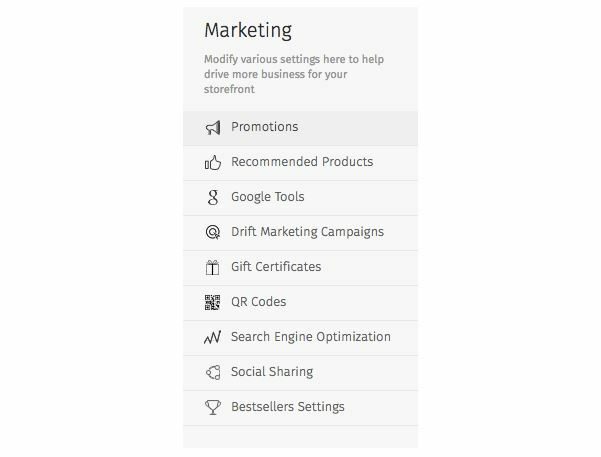 Take a look at some of their built-in marketing options from their store dashboard. They do offer onsite marketing features too, like the ability to run deals, answers customer questions through live chat, and even setup automatic email followup to customers who haven’t completed their purchases. PinnacleCart has a variety of means of getting in touch with their support team. Unlike a lot of software companies, they do offer phone support. However, their phone support is only available on weekdays from 6AM-7PM PST, and Saturdays from 9AM-6PM PST. So, if you’re in a conflicting time zone it might be difficult to speak to an actual representative. That being said their email support is quite helpful. They also offer extensive documentation and assistance in the form of blog posts, video tutorials, a user forum, their knowledge base, as well as their social media accounts. If you run into an issue, their team will be able to handle the request swiftly and easily. Aside from their support team having your back, your site will also be equipped with very high security standards, since they are PA-DSS and PCI certified. Whether you’re selling digital products, subscription, or actual goods, PinnacleCart lets you setup any kind of online storefront. If you’re selling digital goods, then the URL will remain hidden and only delivered via email until buyers purchase your product. Plus, you can even limit the number of digital product downloads too. Their product management screen is fairly straightforward and lets you input whatever details you’d like regarding your products. PinnacleCart has everything you need to manage, track, and fulfill whatever you’re selling. Below we highlight some of the best reasons for you to consider PinnacleCart. It’s not the perfect software, but if you’re looking to grow your eCommerce store and want to do everything under one roof, then it could be a great choice for your growing business. Once you get past the initial setup of your store it’s incredibly easy to manage and make small tweaks to your storefront. Plus, if you do run into an issue their support team is top-notch. You can submit a support request via email, or even by phone, if it’s during regular working hours. Lastly, we’re big fans of the promotion and integration options. Want to add features to your store, like email marketing, or easy accounting? All you have to do is utilize one of their many add-ons. PinnacleCart makes it easy to sync your products with existing online retailers like Amazon and eBay. This alone will save you a ton of time, while getting your products in front of new customers. Overall, the majority of reviews and overall user experience with the software has been overwhelming positive. However, there are certain drawbacks you need to be aware of. For example, the learning curve to master the software is pretty steep, especially if you haven’t used any other similar softwares in the past. That being said, there’s enough support and technical documentation to help you accomplish your goals with the software. Also, if you’re looking to do extensive customization to your storefront with HTML and CSS, then this might be a little difficult, as the codebase can be difficult to modify if you’re not an expert. Finally, there are certain missing features that might make or break your decision. Like the lack of a built-in blog, POS application, and the ability to include customer loyalty programs. What Kind of Business Owner Should Use This Software? Now, you’re probably wondering if PinnacleCart is going to be the right choice for your business? Since, it is quite feature heavy and the learning curve is a little steep, it isn’t perfect for every online seller out there. Below we highlight the kinds of businesses who can benefit from using PinnacleCart. If you have an existing storefront that handles a large volume of sales of products. PinnacleCart will even handle the cart migration for you. If you’re planning on growing your site to a high volume of sales and traffic. You’re relatively tech-savvy, or comfortable learning about technology to get the most from this software. That being said, if you’re planning on keeping your business small and don’t have the need for a managed solution, then you’re better off looking elsewhere. If you’re selling simple services, or downloadable goods, then often a simple PayPal integration will do the trick. PinnacleCart can be a great choice for online sellers of any size. With their lower level plans they offer a ton of value to beginners just getting started with their online stores. Experienced sellers who are looking to easily scale and manage their existing stores will also find their software incredibly useful. However, if you’re a smaller seller who is just looking to sell a few items here and there, or, already have an existing site and are looking to add the ability to sell products, then you might be better off looking elsewhere. Pinnacle is a great all-in-one solution for those who take the success of their online stores seriously. Especially because you have everything you need to manage and grow your store, all under one roof.